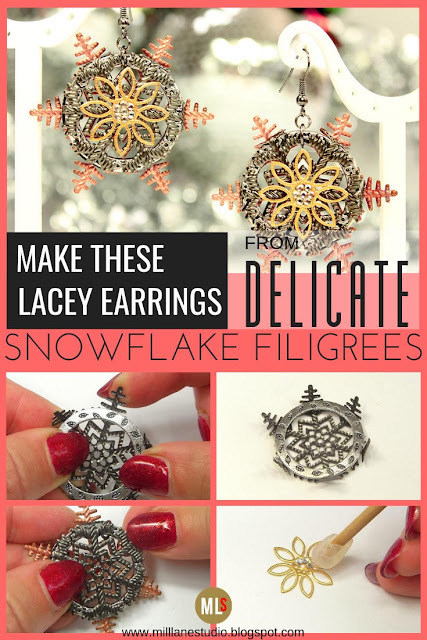 There's no doubting that these snowflake earrings are Christmassey, yet there's not a speck of red or green to be seen. 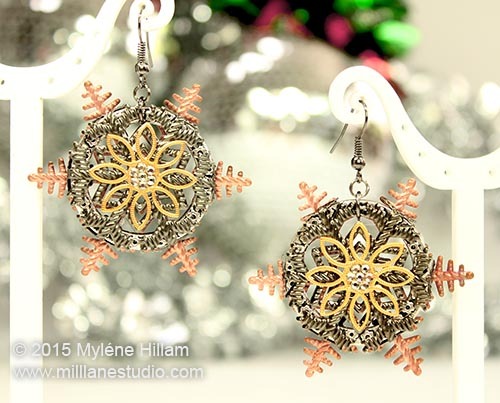 Day 9's earrings combine filigree snowflakes in copper and gunmetal with a gold filigree daisy for a very sophisticated look. 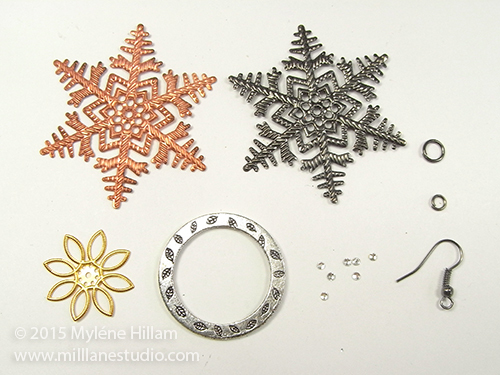 Centre the ring on the gunmetal snowflake and press each of the arms of the snowflake upwards to cup the ring. 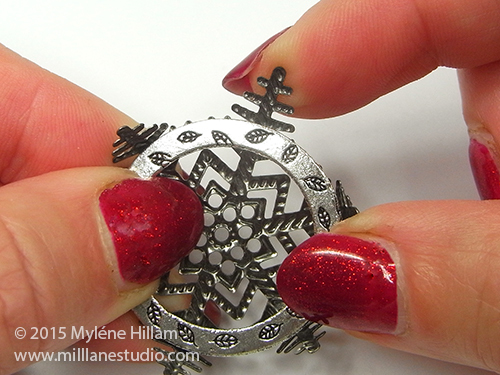 Make sure the ring is still centred and then flatten each of the arms. 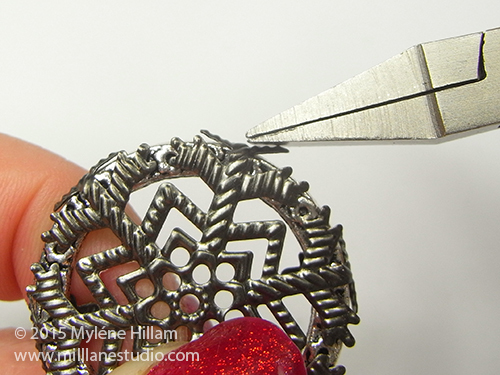 Use the back of the pliers to press the filigree against the outside of the ring. 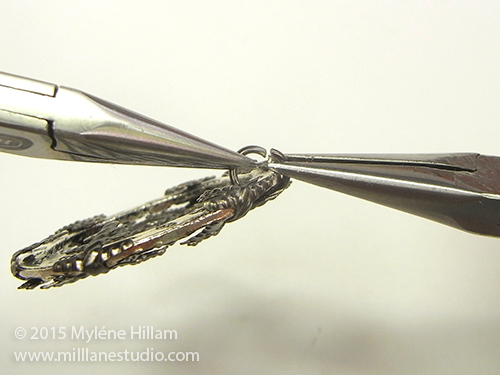 Attach the 6mm jump ring to the silver ring and close it. 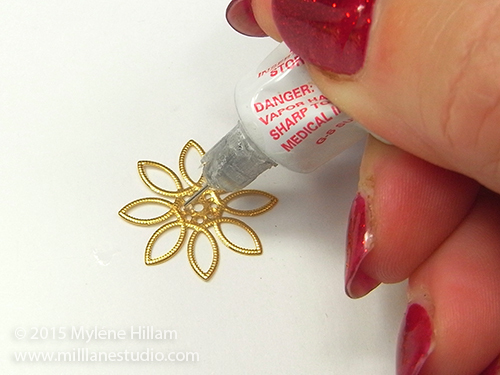 Apply GS-Hypo Cement to the centre of the gold filigree. 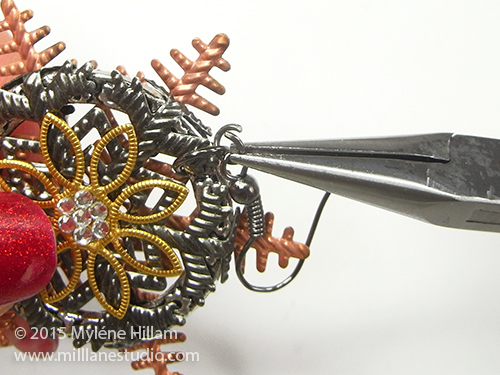 Position a cryatal in the centre of the filigree and six crystals around it. 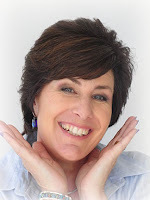 Press them firmly into position. 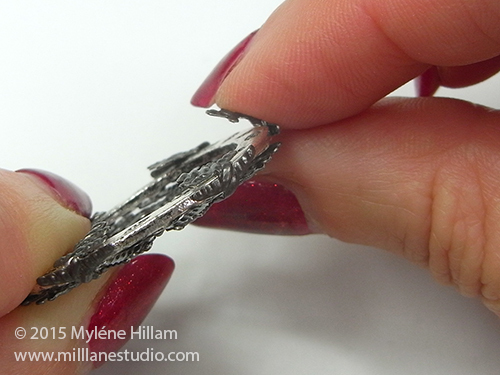 Use the toothpick to apply Quick Grip to the folded over arms of the gunmetal filigree. 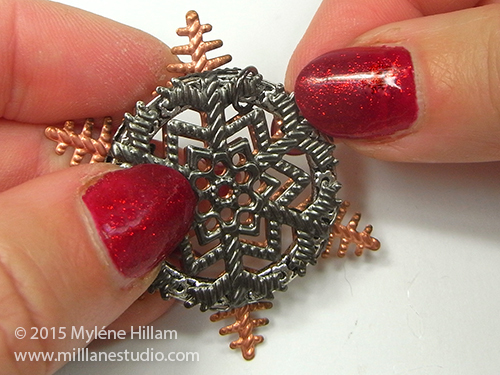 Align the gunmetal filigree with the copper snowflake and press them together firmly. 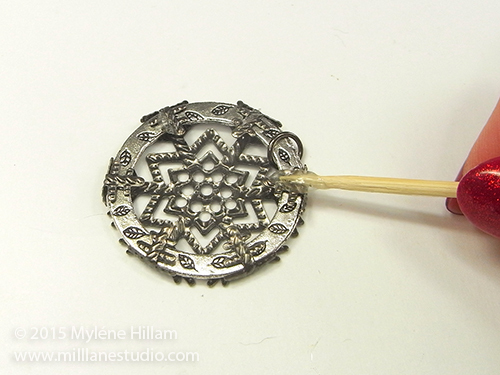 Apply adhesive to the back of the gold filigree and position it over the centre of the gunmetal snowflake. 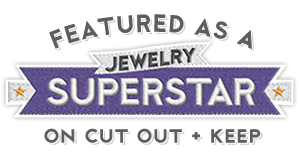 Connect the 6mm jump ring to the earring wire with a 4mm jump ring. 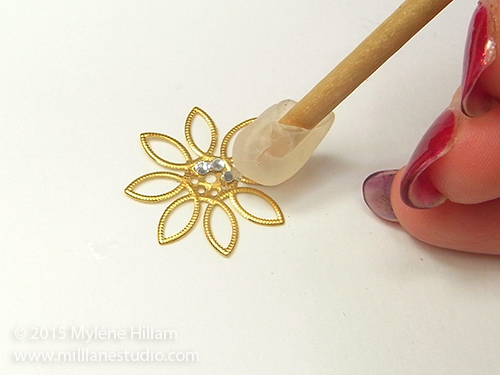 Use the remaining components to make a matching earring. 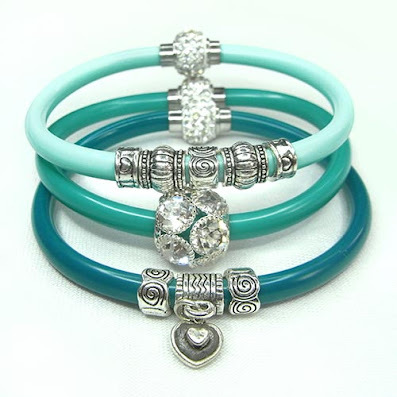 Mixing metal colours in this way gives your jewellery a really unexpected look. 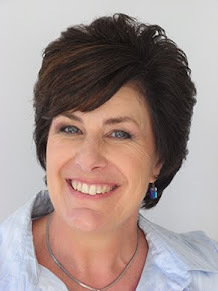 I'm sure you'll agree that these mixed metal earrings make a welcome change to the usual traditional Christmas colours - they will give your Christmas outfits a really unique look! If you like this snowflake design, you might also like these!